Growing demand from commercial sector, boost in construction activities, increasing IT & security spending and emergence of new technology based access control systems are driving the growth of access control market in Turkey. The growth in the access control market is also coupled with urban revitalization and the ongoing city transformation projects, especially in big cities. According to 6Wresearch, Turkey access control market is projected to record $87.5 million by 2021. In Turkey access control market, card reader systems accounted for majority of the revenue share, followed by increasing demand for next generation biometric access control systems, and further affecting sales for card reader systems. In the forecast period biometric technology based access control systems to cite declining price trend, subsequently increasing its market share in the overall Turkey access control market. In terms of revenue, the market demand for access control systems in Turkey is majorly driven by the commercial offices vertical, followed by verticals such as government & transportation, banking and financial etc. The commercial offices vertical is projected to hold largest share of the market pie in the country, through the forecast period as well. The report thoroughly covers the access control market by types, verticals and regions. The report provides an unbiased and detailed analysis of the on-going trends, opportunities/high growth areas, market drivers, which would help the stakeholders to decide and align their market strategies according to the current and future market dynamics. 13.2	Bosch Security Systems, Inc.
13.6	Lenel Systems International, Inc.
13.8	Rosslare Security Products, Inc. 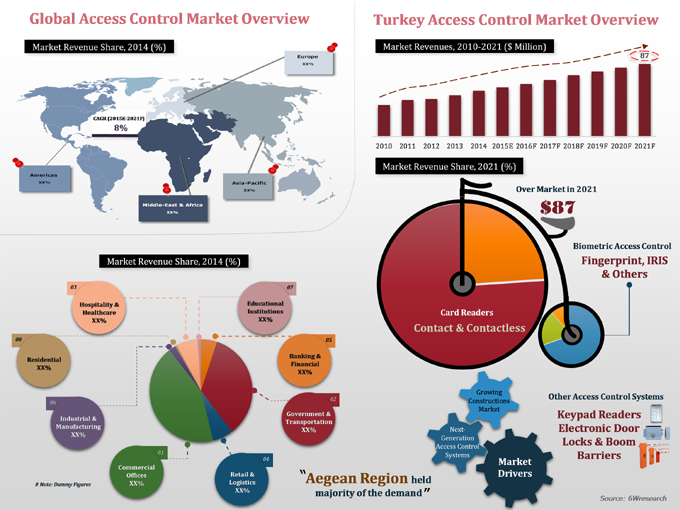 In the overall Middle-East access control market, Turkey accounted for largest share and is one the early adopters for access control systems' technology. The market for access control in Turkey is being buoyed by several factors, predominantly rising security concerns, increasing IT security spending and strengthening of constructions market. Apart from card readers, Turkey is witnessing increased demand for biometric technology based access control systems, where fingerprint technology type dominated biometrics segment. In the overall access control market, card readers acquired majority of the market share, wherein, contactless/ proximity card reader access control systems contributed significantly. On account of declining prices, Turkey is citing immense growth for fingerprint technology based access control systems along with increasing consumer awareness and market players. The major companies in Turkey's access control market include- 3M, Bosch Security Systems, Genetec, Honeywell, IDTECK, Lenel Systems, Morpho (Safran), Rosslare Security, Siemens and Suprema.